One of the reasons why I continue to add plug-ins to Photoshop is because I have a lot of older photos that are bad because they were taken with little point & shoots, usually at home inspections where I didn’t need great clarity, contrast, etc. I like them but have no creative idea of what to do with them. Many of the plug-ins can give me ideas. 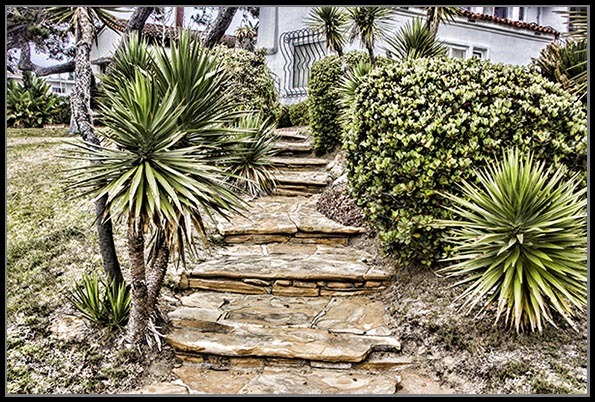 Following are three pictures of walkways—two exterior stairs and one path. All three of these create trip hazards, a major cause of accident and injury around our homes. That was why I took a picture of them to begin with, to warn my Clients about trip hazards. Even if they were not trip hazards in and of themselves, whenever you’re somewhere unfamiliar, such as a new home you just bought, you will find trip hazards as you become accustomed to that home. 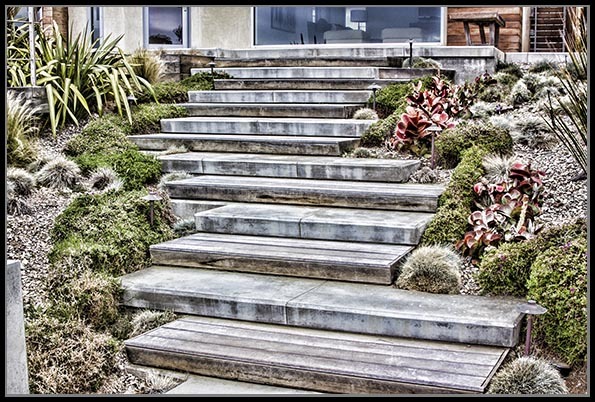 These three pictures specifically illustrate poor construction of the stairs and paths. As a disclaimer, I’ll say that I like unique and unusual just as much as the next person, but when it comes to finding and using trip hazards, I’m a poster boy. The two stairways are uneven in their vertical rise or their horizontal run, sometimes both, as well as their width. If you pay attention to how you walk, you’ll find that you don’t look down at each and every step once you get an overall view of what you’re going to be doing. You simply walk. When the rise and run is inconsistent, or each step has a different width, you either have to continue to look down and risk running into something else (bushes), or you have to pay attention to where you’re going, instead of how you’re going, and risk tripping. 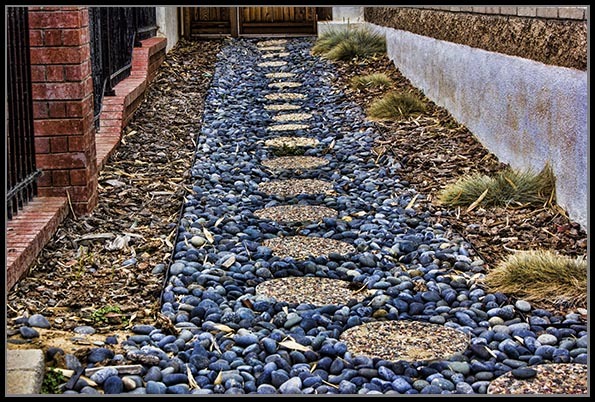 A pathway constructed of stepping stones, gravel, bark, and other loose landscaping materials will never be even, so you still have to be extraordinarily careful. If you like that kind of landscaping, install landscape lighting in case you have to walk that way in the dark. Also, before you build it, walk the path you’re going to build. Wear shoes that have a good sole pattern so you can see exactly where your feet land during your normal walking pace. Place large stepping stones where your footprints are. Because these three pictures illustrate doom, I went looking for a filter that could take a bad picture and make it look doomy. In this case, I used filters in the Topaz plug-in. This entry was posted in Adobe, Corel, Home inspections, House & Home, How I Did It, Manmade, Photos, SNIPPETS and tagged home trip hazards, house and home, pathways, stairs on November 6, 2013 by Russel Ray Photos. The older one gets the more careful one has to be of pathways. It’s amazing how much more inviting the last path is with your changes… AWESOME!! Thanks! It’s nice to have an appreciative audience. on steps and stairs” This is from our national Accident Compensation organisation. They would love your post! If we fall on our stairs and steps the Accident Compensation Corporation picks up the tab!!!!!!! We do, but some say that having easy access to the national insurance scheme encourages us to be careless. However, I have been very grateful to ACC because even a very careful person like me has an occasional accident. Which has never made sense to me. Who wants to be in pain just to get access to insurance? I know not a single person………………. And our no-fault/no-blame accident insurance also covers visitors to the country……which is very generous. Canada’s does, also. I have a friend who vacations in Canada every summer. He takes his family and all the children and they get their annual medical checkups there, free. Looking where you’re going is very important if you for example wish yo avoid walking into a lampost and smash front teeth! !